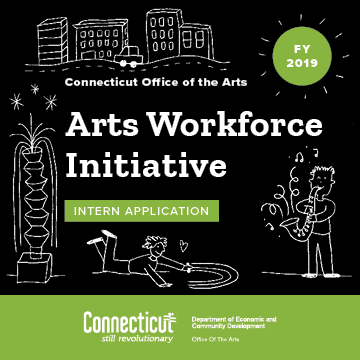 The Connecticut Office of the Arts' (COA) Arts Workforce Initiative has been specifically designed to provide internships for Connecticut college students, emerging creative professionals and military veterans. Our agency will select 37 interns, a combination of college, emerging professionals and veterans, who have experience in or wish to grow professionally in the areas of arts administration, arts presenting/curating, media arts, performing arts, visual arts, arts education, and literary arts and match them with an organization that is aligned to their professional goals and desired career track. During this internship you must complete a total of 250 hours. Selected interns will work out the schedule with the hosting organization. Selected host organizations will be granted $3,750 per intern and will pay the intern at the rate of $15 per hour. The Deadline to Apply is April 22, 2019. Notification of selections will take place on or before May 13th. Internships will begin in June. The Bruce Museum, a historic institution located in Greenwich, Connecticut, seeks an intern for the spring of 2019. The intern will work closely with the museum’s Director of Marketing and Communications to promote and maintain the well-established public view of the institution, broaden its reach and grow the numbers of visitors. The Bruce Museum is a local jewel, regularly reviewed but the New York Times art critics as a must see Museum. Through the display of its collection of nearly 16,000 objects and its rotating display of world-class exhibitions, the Bruce Museum promotes the understanding and appreciation of Art and Science to enrich the lives of all people. This internship provides a unique opportunity to understand how marketing and PR works and is essential in a non-profit institution. Independence and initiative make that the learning curve in this role is steep and a great future asset for students with Marketing and PR ambitions. Design new concepts for lasting engagement with key stakeholders. The Bruce Museum, founded in 1908, is a world-class, community-based museum that promotes the understanding and appreciation of Art and Science. The comprehensive collection of 15,000 objects includes art of the United States, American Indian, Asian, European, and pre-Columbian art, as well as decorative arts, costumes, textiles and natural history and science specimens. The Museum mounts between 12 and 16 exhibitions annually, many with scholarly publications, and the majority of which are curated by museum staff. As an educational institution, the Bruce Museum provides programs for diverse audiences that relate to the permanent and temporary exhibitions and collections. The Museum is located in Greenwich, Connecticut, 35 miles east of New York City, just off I-95 and steps away from Metro-North Railroad’s Greenwich station. The Bruce Museum seeks an emerging scholar to work with curators and educators in researching and developing all aspects of art exhibitions and related programs. The Zvi Grunberg Resident Fellow will assist in the planning and creation of art exhibitions and will be responsible for the implementation of related research, interpretation, and administrative duties. The Fellow will have the opportunity to curate an exhibition from the Museum’s collection of works on paper. The Fellow will also manage the development and implementation of adult public programs, some of which include lecture and film series and educational special events. This Fellowship offers a unique opportunity for object-based research and the creation of educational programming. Further, the position will include access to senior staff for personalized career-mentorship. The Zvi Grunberg Resident Fellowship term is 39 weeks, starting July 1, 2019, with a stipend of $25,000 and generous paid time off. This is a full-time, temporary position, 35 hours per week, for a maximum of 39 weeks. He/she is expected to spend his/her fellowship period in residence at the Bruce Museum. Consideration will be given to students currently pursuing a Ph.D. in art history or a related field and recent graduates from an M.A. program in art history or a related field. In all cases, the most competitive candidates will have expressed interest in a museum career. The following items are to be included in the application (incomplete applications cannot be considered). 1. A cover letter explaining the applicant’s interest in the fellowship and his/her status in their M.A./Ph.D. program. The letter should include a personal statement indicating how this fellowship fits with your degree/career preparation, experience, and goals. Essay should not exceed 500 words, or two double-spaced typed pages. 2. Complete curriculum vitae of education, employment, honors, awards, and publications with phone and email contacts listed. 3. Two letters of recommendation, one should be from Department Chair or Academic Advisor if possible. Letters should be sent directly by recommenders. 4. Undergraduate and graduate transcripts from all colleges, universities, and professional schools previously attended. Unofficial transcripts are acceptable. 5. Writing sample from an academic paper or published work; should not exceed 4,000 words. A Selection Committee consisting of staff members will review applications. A small group of applicants will be invited for final interviews. The application due date for the 2019-2020 Fellowship is Monday April 1, 2019. Kathleen Holko, Manager of School and Tour Services, at kholko@brucemuseum.org. Career Internships are available for college and university students, are unpaid and are usually taken for credit. Non-credit applications are accepted for those wanting to gain experience. Applications for the Fall Semester (September-December) are due by August 1. Applications for the Spring Semester (January-May) are due by December 1. Applications for Summer posts are accepted beginning in January of each year and are due by April 1. 2. Letter indicating how this internship at the Bruce Museum fits in with the student's preparation, experience and goals and the college department granting the credit. 3. A letter of recommendation from a faculty member who will act as the student's sponsor. (A letter of recommendation is required even if the internship is done for non-credit.) This should be sent directly by the faculty member. The sponsor acts as the administrator/facilitator any for college/university procedures required for the student to earn credit. The number of individuals who will be able to participate during any one term will be limited. The Museum suggests 120 hours of time per semester. However, this will vary according to the college requirements of each intern and the number of credit hours the college will allow the intern to earn. Each student will be assigned to a Museum staff member whose expertise corresponds to the special interest indicated in the student's letter and application. Activities designed for college credit will be an accurate reflection of the normal daily work of the museum professional in the student's area of special interest. No student will be paid for any work performed for college credit, and the Museum is not in the position to offer employment to interns upon completion of the academic term. Housing will not be available. If you have questions or would like to submit an application, please contact Kathleen Holko (Manager of School & Tour Services) at kholko@brucemuseum.org. No phone calls please. Applications for the Sept - December semester are due by September 8th. Applications for the January - May semester are due by January 15th. The Bruce Museum’s Youth and Family Programs Internship is designed for university or college students seeking to gain hands-on experience in a museum education setting. This internship is available during the academic year, September – June. A minimum of 120 hours per semester is required with no more than 150 hours per semester. This is a paid internship with an hourly rate of $12.00. This position requires availability on Tuesdays and Sundays. The exact details of the schedule will be worked out with the individual as the internship begins. This internship will focus on providing opportunities for family engagement in an art and science museum. The intern will be working primarily with the Museum's Manager of Youth and Family Programs on a variety of projects related to the Museum’s family programming. The intern will experience key aspects of museum learning including: teaching from the object; working with multigenerational audiences; developing and leading family programs at the Museum. While family programming is the internships primary focus, the intern may have the opportunity to work with school audiences through in-house school programs and the Museum’s outreach program – the Brucemobile. Specific duties include: preparing materials for programming; interacting with visitors and groups through educational activities and tours; developing and implementing educational programs for various exhibitions; and evaluating educational programs and resources. Experience in the following areas is preferred: museum education experience; experience supervising children; teaching experience; good written communication skills; public speaking skills; background in educational theory and practice; computer skills, word-processing; and basic office skills. The Bruce Museum is a small institution and all staff members, as well as interns, are often called on to do any number of things such as assisting with public programs, basic office work, mailings, etc. The internship will provide an introduction to standard museum practice and provide a hands-on experience in museum work. At the end of the internship period, the staff supervisor(s) will complete a Museum Intern Evaluation form. A copy of this evaluation will remain on file in the museum and copy will be forwarded to the intern and/or the faculty advisor. If the intern is seeking college credit and the college has similar forms or requests a report from the museum staff, the appropriate forms or information must be supplied well before the end of the internship period. Finally, the intern will complete an Exit Interview form evaluating the intern’s experience, which is to be submitted to Museum Staff and kept on file at the museum. Application Deadlines: Fall semester - September 8th. Spring/Winter semester - January 15th. Education Internships are available only during the academic year, September – June. Please include application form (click on link), current resume, and letter of interest. This internship begins in mid-late June and finishes at the end of August.